Yang Shan County situates at the mountainous areas of northern part of Guangdong Province with a population of about 540,000, mostly poor peasants engaging in farming activities. The level of economic development and medical care is extremely low. In these vast remote areas, there is a huge number of cataract sufferers (patients) who are in need of cataract surgeries. They need care and helping hand from the community. Since 2005, Green Action Charity Foundation Limited (GACF) had conducted “Cataract Surgery Programs” at Yang Shan County twice every year, providing free cataract surgeries for the underprivileged, including the removal of the cataracts, placement of Intra-ocular lens, medical check-ups before the surgery so as to ensure surgical safety and medicine before and after the surgeries. There were totally 1,724 and 47 eligible patients benefited from the cataract surgeries and excision of Pterygiums respectively (figures were as at the end of October, 2012). The accomplishment was obvious as manifested by the joy exhibited by the patients and their family members at the moment the patients resumed seeing things. All the participants and volunteers were deeply impressed and shared their feelings and joy. Expecting the Re-gaining of Vision – Waiting for the Eye Examination. 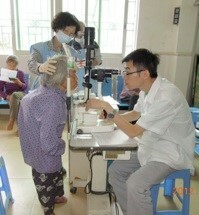 With the full co-operation and strong support from the Government and Health Bureau of Yang Shan County, the local Heung and Town Authorities, the China Disabled Persons’ Federation (Yang Shan County) and medical expertise support from Xinhui People’s Hospital and New Hope Eye Care Hospital, the cataract surgeries under the two Cataract Surgery Programs were normally conducted annually in May and October respectively. GACF was responsible for fund raising, organizing volunteers from Hong Kong and China for the programs and coordination of all participating local authorities, organizations and personnel to ensure smooth running and success of the programs. GACF has no administrative expenses. All donations are wholly used in the respective charity projects and volunteers have to pay for their own expenses. Grandma – Oh! Your Cataract is Very Mature ! The generous donations from Fu Tak Iam Foundation Limited (FTIF) in 2009, 2011 and 2012 have enabled GACF to help currently more than 300 patients to re-gain their vision annually. This tremendous support has enabled the poor to turn over a new leaf and has created long term positive impacts in the community. About 90% beneficiaries are the elders. About a month before the cataract surgeries is the screeninging stage. Our volunteers made joint efforts with the China Disabled Persons’ Federation, Yang Shan County and the Medical Team (who brought along their medical equipment) to set up 6 screening stations at different villages/towns for the 3-day screening exercise. This arrangement facilitated and encouraged the patients to come forth for the screening. The purpose is to select the financially eligible and medically fit patients for free cataract surgeries and to issue them the Appointment Notices. The advantages for conducting the screening stage are mainly : (a) To facilitate those poor peasants scattered in the remote mountainous areas to come up for screening; (b) To find out and to monitor those patients suffering from uncontrolled or unknown hypertension or diabetes so as to ensure surgical safety and to maximize their chance for the surgery. (c) The Appointment Notices allow the relatives to make prior arrangement to return home from their distant working places to take care of the patients during the surgical and recovery period. 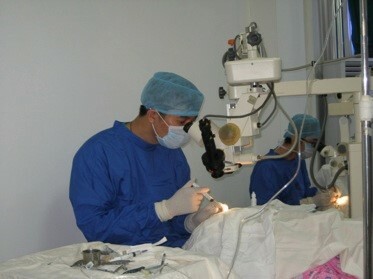 In the surgery staft, cataract surgeries were operated at Yang Shan People’s Hospital according to the order of the Appointment Notices. The patients had eye examinations again the next morning to assess whether the surgeries were successful and to rule out any complication before discharge from the hospital. 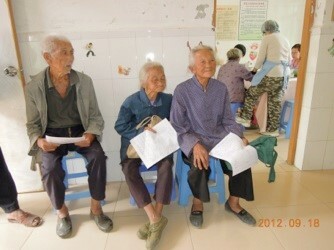 The relatives were taught and instructed how to take care of the patients at home by our Hong Kong nurse volunteers. 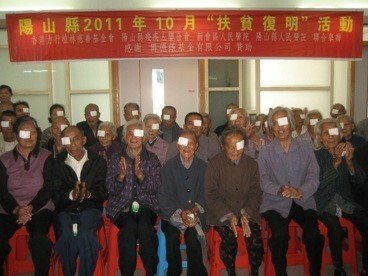 The main reason was to help the patients to re-gain their vision and to prevent the occurrence of blindness. Some cataract patients, selected for cataract surgeries, had Pterygiums which blocked their eye and this must be excised before cataract surgeries could be operated. Some other patients’ Pterygiums blocked their pupils, either partially or wholly, and seriously affected their vision so they must be excised in order to re-gain their eye-sight. By 2011, Ms. YEUNG Chui Chun, aged 80 of Yang Shing Town had already lost her eye-sight for 4-5 years. Eye examination revealed that her eyes still had light perception but her cataracts were hypermature. She underwent the cataract surgery and the placement of Intra-ocular lens for her left eye on 17th May 2011. Examination on 18th May revealed that her vision reached 0.3 and could see her son again. She was very excited. Prior to the surgery, her 2 sons took care of her by turn and therefore caused serious financial hardship to the family. Now, as she could take care herself and her 2 sons could work at a hydro-electric station and a cement plant respectively. They earned steady income and family life had been improved since then. By 2012, Ms. LEE Mui, aged 80 of Siu Kong Town had completely lost her vision for 2 years. She was living with her eldest son who was deaf and dumb. Her younger son had to stay at home to take care of her and therefore the family had no income. At the time of screening, her right eye had no light perception at all, so surgery could not help. Luckily, her left eye still had light perception and surgery helped her to re-gain her vision, enabling her to take self-care and releasing her younger son to work elsewhere to earn money for the family. There was a story behind every patient. All participants felt relieved and joyful on seeing their smiles after the surgeries. Helping the patients to re-gain their vision could effectively reduce the ill-effects of blindness. In every screening exercise, we often found patients with cataracts becoming hypermature, they would then swollen and cause complications of glaucoma. For the latter cases, surgeries had no positive effects. As there was no other way out, their family members could only take them home silently in despair. Helping the patients to re-gain their vision could change their former desperate life and could enable them to see their relatives and the world with smiling faces. They could now take care of their own daily life, so their younger family members could go working elsewhere to improve their living standard. Some aged patients having re-gained their vision could even take care of their grandchildren, do farming and household work as well. The Greatest Love Has No Shape Nor Limit and Extends Everywhere, Genuine Charity Needs No Announcement, the Greatest Virtue Is Unselfish: FTIF’s strong support, concerted efforts from participating agencies and volunteers have made the underprivileged patients living in these remote and backward mountainous areas re-gain their vision and turn over a new leaf with smiles.